Corningware, Body Slams, and The Kitchen Code. As I was turning the corner I reached the kitchen section of the Bed, Bath & Beyond. Seeing how I don’t have a kitchen at the moment, I normally wouldn’t stop by this section. Normally I wouldn’t pass by at all, unless I needed pots or pans. I mean how many wooden spoons do you really need? But I saw the Corningware display, and I laughed. I had no idea that this crack and chip resistant ceramic stoneware would cause such passion. Now apparently chicks are pretty attached to their Tupperware and Rubbermaid containers. Don’t go taking them without returning them ASAP. It’s the code of the kitchen — an unspoken rule. Those that violate it no longer receive leftovers for lunch. They have to survive with what fits in Ziploc bags. However if it’s Corningware … dude … apparently the stakes go up. It’s Corningware. It doesn’t absorb food odor, flavor, or stains. 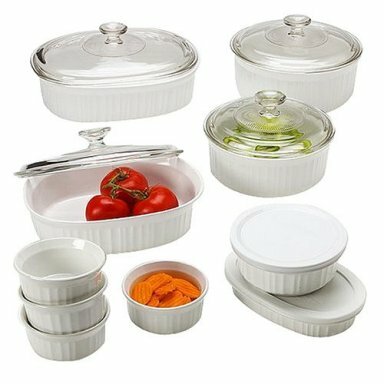 It the Cadillac of bakeware and food containers. It’s beloved by its owners. This is only one of the lessons I learned in school. Back in college everyone hears those crazy roommate stories. Those I-can’t-believe-that-happened moments. Yeah, I lived plenty of those, but I’ve got to say that my No.1 crazy roommate moment had to do with Corningware. Danielle and Corningware. Now I won’t go into the elaborate details about how this I-only-flush-the-toilet-on-No.2 roommate was no longer wanted in the house, but needless to say that Danielle’s hygiene habits didn’t help. I know chicks lose hair in the shower. I lose handfuls, but you usually collect them and toss them in the trash. You don’t leave your hair balls for the next person to find in the drain. In addition she was a vegetarian. Now I don’t have anything against these non-meat eaters, my other roommate was also a vegetarian and we got along just fine. I just don’t like vegetarians that hate on my carnivore ways. I like to eat in peace. Her odd pot-smoking behavior (not related to the cannabis either because she behaved the same all the time) created many WTF moments for me. So when she finally departed I felt relieved. I mean, really I was in college hundreds of miles away from home. I didn’t need domestic drama. She left and then there were three of us. I thought it would be all good. Until my other roommate opened up her cookbook to the baking section. She was ready to whip up some Martha Stewart concoction but couldn’t find her coordinated bakeware collection. Apparently all seven pieces, including the lids were gone. My baker roommate flipped out. We got into the car drove to Danielle’s new place. I had no idea how she knew of Danielle’s whereabouts, but apparently she did. When we got to Danielle’s new place she was not there. But her new roommate was and my baker roommate explained that Danielle may have accidentally packed a few of her things by mistake. The new roommate let us in and my baker roommate went to town in the kitchen. She found all seven pieces, with lids and a few other pieces of kitchen hardware. Pyrex. All in all we left with a total of 12 pieces of bakeware and cookware stuff that was “accidentally” taken. As we were leaving the apartment, Danielle walked up and asked about our visit. My roommate began telling Danielle about the Corningware — about the kitchen code — about how she couldn’t steal stuff that didn’t belong to her. Danielle insisted that my roommate was crazy and that the stuff in our hands was hers. I just took the cookware I was carrying to the car. Danielle and my roommate were still arguing, fiercely about the topic. Then I saw Danielle grab hold of the Corningware. They began the tug-of-war. Then the profanity ensued. I decided to walk over there to break it up, but before I could get there my roommate lost it. All of a sudden she let go of the Corningware, grabbed Danielle, and body slammed her like one of those WWF wrestlers. All I saw were Danielle’s legs flailing in the air, and Corningware flying everywhere. It wasn’t that crack resistant. I stood there in awe of what had just happened. My roommate looked up and paused. I rushed into the little Honda civic and started the car. She picked up the only two pieces of Corningware that didn’t break and rushed back to the car. She fastened her seat-belt and looked at me. I guess people should really stick to the kitchen code, especially when something is dishwasher and microwave safe. Huh. I never knew that Corningware could incite such passion. My sister in the SF Bay Area has a few pieces of it. I have never seen her behave like a lunatic about it. Maybe I should try to pack it in my suitcase the next time I visit just to put her to the test? Passion and craziness indeed. You may want to put on some protective head gear before you engage in that adventure.